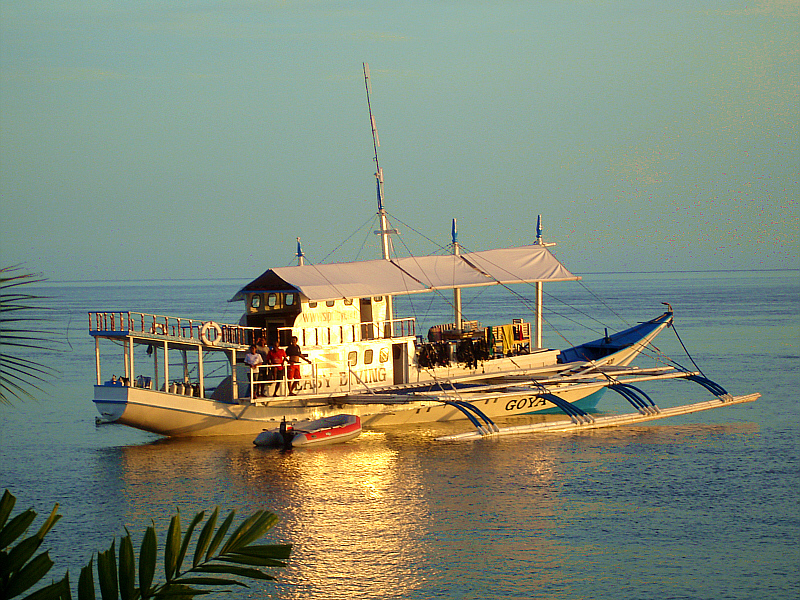 The safari boats are based on the typical Philippine outrigger boats, called bankas, built according to the needs of divers in Sipalay on Negros. Outrigger boats of this size are commonly used by fishermen for multi-day exits or used as passenger ferries. Reconstructed as a safari boat, they provide enough space for 14 divers. These safari ships are not to be compared with the dive cruise ships commonly found in Egypt or the Caribbean. These are considerably more luxurious, the downside of that is being held captive onboard for the entire trip, not so with our dive safaris. The outrigger boats of our dive safaris are much more original, and you are also closer to nature and the elements, but you spend every evening on land in a beach resort. This gives you more privacy, and you can see more of the country and its people. The focal point of the safari boats is the lounge area, with a large table and benches on the fore deck, which gives enough space for 10 divers to sit. The area is covered by a large awning. Here, breakfast and lunch is usually served, dinner is served at one of the beach resorts. There is another area in the stern of the boat, a kind of open cabin where you can retreat. 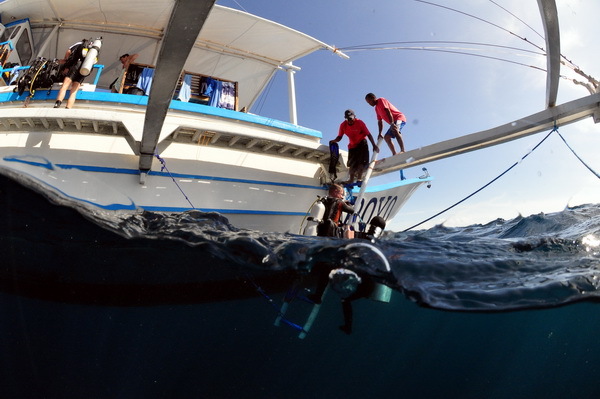 Also the cabin roofs are often used by divers as sundeck. The nets between the outriggers are often used as a place to take a nap or sunbathe between dives. Generally you just grab one of the numerous mattresses, and look for a place where you can lie down and relax. In the engine room there is an opportunity to charge its batteries, power surges and dips are possible, generally we recommend charging overnight in the beach resort. Before the first dive, tropical fruits, pastries and crackers are served. After the dive, there will be breakfast. All dishes are simple plates and are served by the chef and assistant. Also lunch is a simple but tasty dish. Dinner is served in a restaurant on the beach of each island. Drinks on land are billed separately. Those with special culinary wishes or is dependent on a special diet, should let us know when booking, we try our best to implement these wishes. The galley (kitchen) is for the cook and his staff only, guests are not able to access these facilities. The laundry room and toilet are very simple. There is a simple camping shower and toilet available. For showering and emptying the toilet water must be pumped. But you have the amenities of a real bathroom in the beach resort, where you spend the evenings and nights.